Skibinski Associates is an innovative and progressive consulting engineering firm located in State College that has worked on numerous and noteworthy private and public sector projects throughout Pennsylvania. The firm offers innovative solutions in the fields of project management, civil engineering, site development, roadway design, and utility infrastructure. Skibinski Associates is known for its ability to successfully tackle and resolve complex issues with innovation and sophistication, while maintaining a commitment of service to its clientele. This expertise and dedication has made Skibinski Associates into the reputable firm it is today. Market segments include corporate and industrial parks, residential subdivisions, higher education, elementary and secondary education, healthcare, commercial, retail, industrial and municipal projects. We have tackled complex projects and successfully completed them within critical time frames. The firm possesses extensive experience with regulatory agencies, approval acquisition, project financing and fund procurement. Skibinski Associates’ experience with PennDOT encompasses Highway Occupancy Permit (HOP) applications and plans, utility relocation plans, and right-of-way acquisitions. 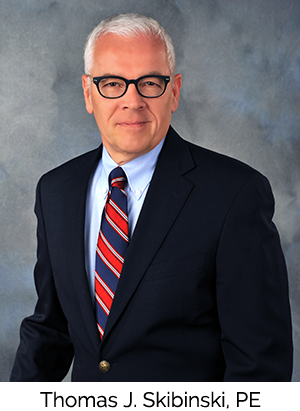 Thomas J. Skibinski, PE is listed on the American Arbitration Association’s roster of neutrals as a construction arbitrator. He is available to serve on arbitration panels to resolve design and construction disputes.